I know what you’re thinking: How do you pronounce that name? As far as I can tell, it’s something like Shhhhhmanski. But here’s the thing: You can probably* just call him Jeff! He certainly deserves the respect and honor of being called Dr. Szymanski, but he’s friendly and open enough that you’ll find yourself on a first-name basis. *For the record, he hasn’t authorized me to say you can call him Jeff. Jeff Szymanski has undertaken the incredible responsibility of leading the International OCD Foundation. It’s a job he seemed born to do. He doesn’t have to have OCD himself to go to bat for us — he seems as genuinely frustrated as we do when he hears “I’m soooo OCD” or that OCD is all about a germ phobia. He’s working hard to overcome stigma and spread the awareness OCD — and its sufferers — so desperately need. Tell us how you came to be the executive director of IOCDF. In 2001 I was hired as a staff psychologist at the McLean OCD Institute in Belmont, Massachusetts, a suburb of Boston. In 2008, as the Director of Psychological Services there, I became aware of the transition at the Foundation. Namely, that the organization was moving from New Haven, Connecticut, up to Boston. During my tenure at the Institute, while I was able to help many people with OCD and related disorders, what I was continually frustrated by was the lack of access many individuals with OCD had to effective care. I worked with many people, who, if they had gotten the right treatment years before, would not have had to suffer unnecessarily for so many years. When I was offered the position at the Foundation, I realized it would give me the opportunity to work on a much larger scale to help those affected by OCD and related disorders in a more macro way. During the 2015 conference wrap-up podcast, you mentioned that your motivation to become a psychologist wasn’t primarily about helping people. However, that’s exactly what you’ve been doing. Did you make a conscious decision to make that shift, or did it happen naturally? When you apply to graduate school you are asked to write a “personal statement.” That is, “Why do you want to be a psychologist?” When I look back at what I wrote then, it was true. I wanted to understand why people did what they did. Why they made the choices they made. This is still the primary driving force in my career. At the Foundation, the question changed to “Why, as a society, can’t people who need access to help get access to that help? How do we, as a group, make decisions in which people who could get better aren’t given that opportunity?” At my core I am a problem solver. I am curious. I like solutions. I don’t see my role as helping people. I see my role as empowering people, giving people access to resources and tools to help themselves. Maybe it’s semantics, but it is how I think about things. What do you see as the biggest misconception about OCD? I wrote a blog a few years back entitled “The ‘D’ in OCD.” I think this captures my thinking about this to this day. If you confuse being “obsessive” or “compulsive” with OCD, then it is easy to dismiss or minimize the experience of actually having OCD. The other common misconception concering any disorder, is that our mental health is 100% determined by our willpower. Our brains, our physiology, the power of habit and a lifetime of habits (that may or may not have ever been “chosen”) are incredibly powerful. When we say to someone, “Don’t be so anxious,” or “You don’t need to worry so much,” we are enacting the fallacy that we can “control” our anxiety or worry. What advice do you have for someone who may not have ready access to the proper care, whether because they live in a rural area in America or in another country? The Internet is the great connector! There are amazing online support groups and a “virtual” community that is willing to be there for people all across the globe. I believe accessing a community can be incredibly healing. There are also more and more internet-based services for people who need more structured support: some therapists treat clients via skype, and there are now numerous smartphone apps to help with self-directed ERP. Here are some of those resources. Every once in a while someone will email me from another country and say they can’t tell their family or friends about their OCD because their culture doesn’t accept mental illness or has strong stigmas against it. How can someone in that situation get support? And how can we help spread awareness in such countries? As noted in my answer above I think that people can connect via the Internet if they have access. This issue is also the main motivation in changing our name to the International OCD Foundation. To widen our focus to those all around the world affected by OCD and related disorders. And to bring together those willing to help. It has been an incredibly rewarding experience to build our Global Partnership program. So much more room for growth there, however. In 2015 we appointed our first international spokesperson, Ro Vitale, specifically to help increase awareness and combat stigma in Latin America. We look forward to continuing to expand Ro’s role in that regard, and continuing to partner with other organizations with similar missions around the globe. With more awareness there will be more acceptance. The IOCDF recently launched a new initiative, asking people to become OCDvocates. Tell us more about that. When I took over the Foundation in 2008 there was so much infrastructure and programming we were focused on building. During those first few years we received an increasing number of people saying they wanted to be part of the mission. But, we didn’t have a place to “plug them in.” Last year, our Director of Marketing and Communications, Carly Bourne, along with our amazing Spokespeople, Jeff Bell, Elizabeth McIngvale, Romina Vitale and Ethan Smith all collaborated to come up with the OCDvocate program. The idea is to have grassroots-based activities and “calls to action” that anyone who would like to participate in can join. An example of this is the holiday card initiative this past year. We asked our OCDvocates to write a personal note in a holiday card so that we could mail them out to patients currently receiving treatment at residential and intensive outpatient treatment programs around the country. Patients were able to receive words of encouragement from those who knew what it was like to be where they were at in that moment and to continue to fight to get their lives back. Anyone can become an OCDvocate by filling out the pledge. What would you tell someone who feels hopeless, who thinks his or her OCD will never get better? I borrow this from the acceptance and commitment therapy (ACT) community: With or without OCD symptoms, what really matters to you in your life? At the end of it all, what do you want your life to stand for? And OCD symptoms or not, how can you commit to making those values a reality? Let’s say I’ve never been to the IOCDF’s Annual OCD Conference before. Why should I go? This one is your hardest question! This is like learning to play tennis by reading a book about how to play tennis. The sense of generosity and community at the Annual OCD Conference is powerful and you can only truly understand it if you have attended one. I believe one of the most valuable experiences for those affected by OCD and related disorders is to find a community like this, and the Annual OCD Conference exemplifies that in spades! One of the most common stories I hear from others with OCD is “It took me umpteen years to be diagnosed because I thought people with OCD just wash their hands a lot.” Another is “I did talk therapy at first and that made my OCD worse.” What can we do as a community to dispel myths about OCD and make sure therapists know how to properly treat OCD? This is a core issue that we focus on every day at the Foundation. Raising awareness about what OCD is and what effective treatment looks like. This is the driving force behind all of our initiatives from the Conference to the Walk to OCD Awareness Week to the OCDvocate program. It is all with the intention of making sure that if you are affected by OCD or a related disorder that you have access to the help you need. One thing that helps tremendously with this, is people like you being willing to share their stories publicly. Whether through a blog, or book, or simply by talking with family and friends. 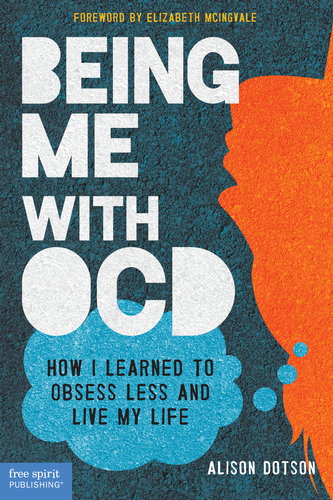 The more representations we have of what OCD actually looks and feels like, the more people will be able to identify their symptoms and find the right help. Sharing stories also helps to dispel myths and combats stigma by putting a (familiar) face to the disorder. Stigma is so often based out of fear and a lack of understanding. By sharing your story, you are actively helping to eliminate that fear. If you could offer just one piece of advice to someone with OCD, what would it be? Get connected. Get involved. On any level.